We can provide you with dental veneers in Houston and use them to transform the appearance of your smile. If you do not like your appearance and your smile is the main reason why you should take steps to correct it. Modern dentistry is a viable option for changing how you look and feel. It does not matter what you do not like about your teeth, we have a solution to correct it. Dental veneers are a popular option because they work with your natural teeth. A veneer is made of ceramic or porcelain. It is a thin shell bonded to the surface of your tooth so your teeth can remain intact while their appearance is transformed. To start the process, we remove a small portion of enamel from the surface of your teeth and bond the veneer to it. This way, the veneer will lay flat and not make your teeth appear overly large. Since the veneers need to be created in a dental lab, you will typically need to wear a temporary set for a week or two. Once the final veneers are ready, you will come back in to have them removed and the permanent ones bonded in place. You can eat all of your favorite foods with veneers and care for them like you would natural teeth, making this an easy to live with, long-term solution. Close gaps in between your teeth. This is a common problem that can negatively impact your appearance. If you have gaps, they will stand out when you speak or smile, making you appear less attractive than you want to be. Closing these gaps is easy, and we can do so without the use of orthodontics by simply placing veneers on top of them. Covering dark stains. As a cosmetic dentist, we can perform a teeth whitening treatment to remove stains and discoloration from your teeth. This will naturally improve your appearance. However, there are times where stains do not come up like they are supposed to. When this happens, dental veneers can be used to cover teeth and create a beautiful smile. Straighten teeth. While veneers do not technically change the position of your teeth, they can be used to make your teeth appear to be straighter. This is done by removing a portion of the enamel and placing a veneer on the surface of the tooth. If you only have one or two crooked teeth, this is an excellent solution, because it can be completed much faster than orthodontics. Restoring damaged teeth. If you have a tooth that is cracked or chipped, visit our office for a dental restoration right away. It is important to do so to ensure you do not develop an unnecessary infection or that you do not experience discomfort. Veneers are an excellent restoration that looks natural. 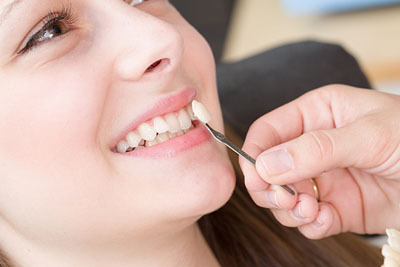 To learn more about dental veneers in Houston, call (281) 477-7200 and schedule an appointment.